Easy Vegan Chorizo- Packed with protein and healthy fats, this easy vegan chorizo is nutritious and full of flavor. Comes together in just 30 minutes! Whenever I tell people what I do for a living, they always ask me where I get my inspiration from. The truth is that it often comes from multiple places. Like what produce is in season, what I’m currently craving, or what I think my audience might enjoy. But my absolute favorite place to draw inspiration from is our travels. That said, sometimes our lifestyle doesn’t leave room for frequent traveling. So when I’m in need of some inspiration what I like to do is dream of location we want to visit then search the menus of restaurants in those areas. I did this recently while fantasizing about taking a foodie trip to New York City. 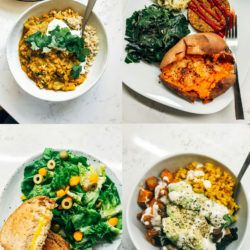 There are so many incredible vegan restaurants there it makes my head spin. One the most enticing options I came across was Modern Love in Brooklyn (owned by the incredible Isa Chandra). The menu is full of drool worthy creations but the one that especially stuck out was their chorizo nachos made with sundried tomato and walnut chorizo. 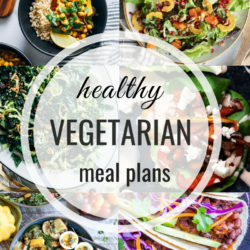 I thought that sounded like such a simple and flavorful combination which would be perfect for an easy plant-based meal at home. A food processor is key for this recipe so if you don’t have one, now is a great time to invest. 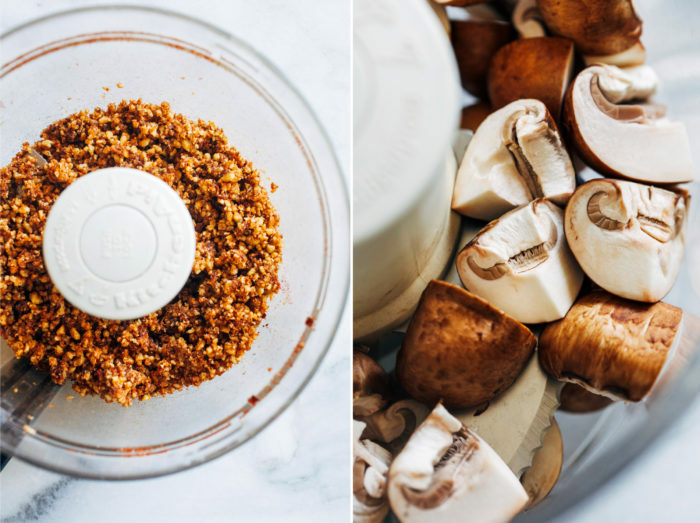 You’ll use it to finely chop and blend the walnuts with the sundried tomatoes and seasonings, as well as finely chop the mushrooms. Transfer the mushrooms to a skillet and cook until they release their liquid. Add the finely chopped walnut mixture to the skillet, stir to combine and cook until heated through. 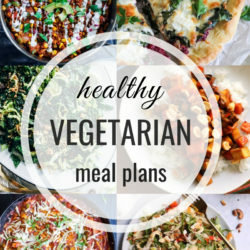 Serve warm as tacos, nachos, on top of veggie spirals…the options are endless! Although this vegan chorizo comes together quickly, it’s also great to prep a fews days advance. Then all you have to do is heat and serve as desired. 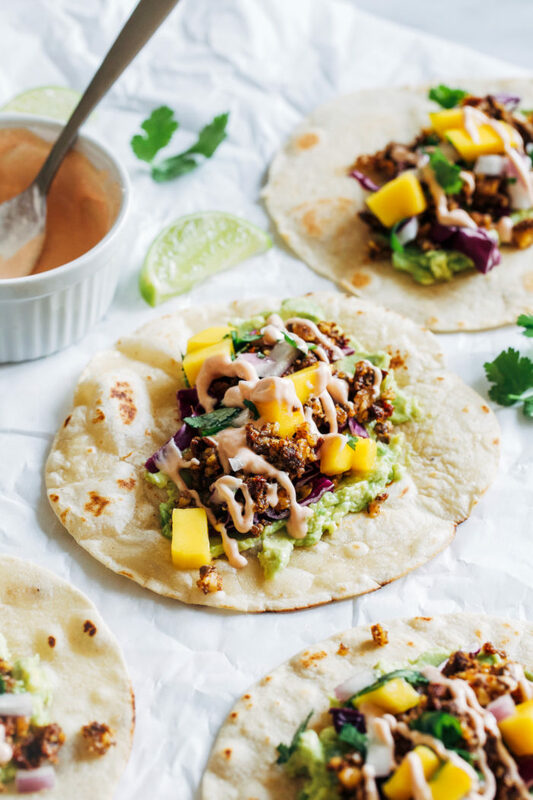 My personal favorite is to make tacos with grain-free cashew tortillas, mashed avocado, and mango salsa topped with a creamy hot sauce (which is just vegan mayo mixed with sriracha). 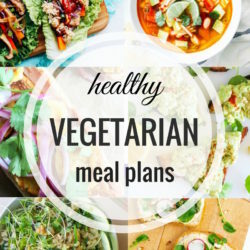 It makes a great option if you’re looking for a lower carb plant-based meal! 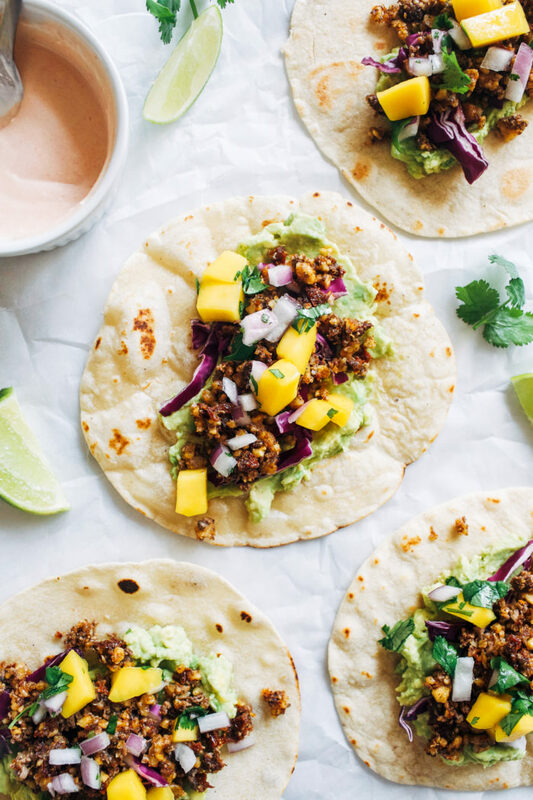 Packed with protein and healthy fats, this easy vegan chorizo is nutritious and full of flavor. Comes together in just than 30 minutes! In a food processor, add diced mushrooms. Process until finely chopped. Warm a skillet over medium heat then add oil. Add the mushrooms to the skillet. Cook until they start to release liquid. Set heat to low. 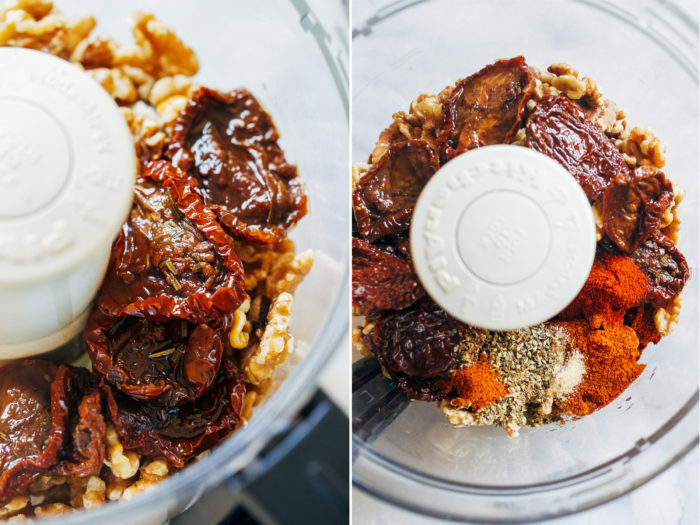 To the food processor, add the walnuts, sundried tomatoes, and all of the seasonings. Process until tomatoes are finely chopped and small bits of walnuts remain. Transfer the mixture to the skillet with the mushrooms. Bring heat to medium, stir to combine, and cook for about 5 minutes, until walnuts are toasted and the mixture is warm. Taste test to see if you would like to add salt or more seasonings. 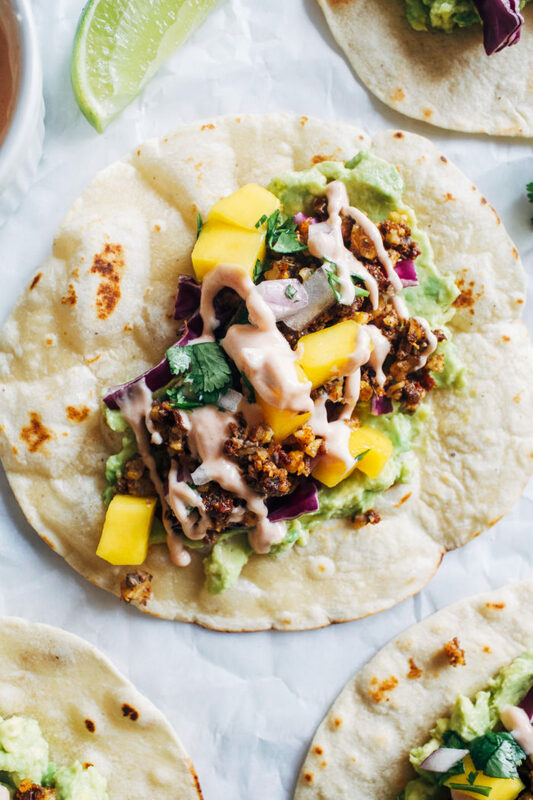 Serve vegan chorizo with warm tortillas and desired toppings, end enjoy! Oh yum! I’m lazy, so I usually buy TJ’s soy chorizo, but this looks so much better! 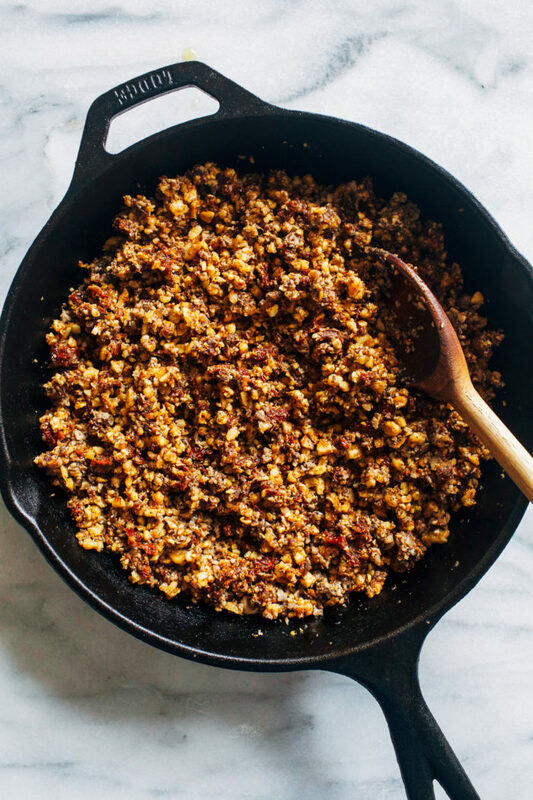 I love all the ingredients you used in this chorizo recipe, it sounds so flavorful! Those look mighty delicious for being meatless tacos, my friend. If I ever went to your house for dinner I’d definitely want you to make these. haha. I’ll have to give them a try next week! I’ll let ya know what we think. GIRL! This is making my mouth water so hard, I can barely stand it! It’s difficult to find a cleaner store-bought chorizo option, so I usually stay away from it entirely. 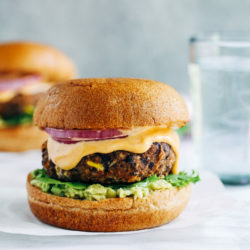 Loving the concept of this plant-based version with ALL THAT FLAVAH! Okay, but most importantly: talk to me about these tortillas! Corn? Flour? Homemade? Do you have a recipe? I just had dinner, and they’re STILL making my mouth water! Ah yes, one of my favorite aspects of traveling is THE FOOD as well…of course! :) Thanks for the restaurant idea. Now that I’m only an hour train ride away from NYC, I’ve been venturing in for all sorts of city fun: to see concerts, do Christmasy thing, see shows, and just a few weekends ago I met a few college girlfriends for a girls’ day. That is so awesome! NYC seems like a foodie’s paradise! 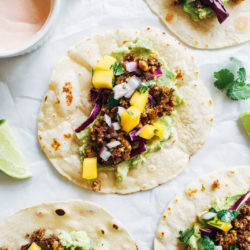 We had these AWESOME vegan chorizo tacos while in Savannah this summer and I’ve been meaning to try to make it at home since we loved it so much! This looks delicious!! SO much umami here Sarah! I love your foodie inspiration even while not traveling. It’s a virtual trip! I had something like this years ago from a taco truck … your take on it has my mouth watering, totally! I just love the texture of walnuts in tacos! SO much flavah! Awesome! I’m so glad to hear that. Thanks for the review.